Part of the Hurricane wing still showing traces of paint. Malta, April 25, 1942. The population is starving. Relentless bombing attacks have the island on its knees. Ships bringing essential supplies have to face not only the wrath of the Axis air forces but also U-boats and Italian submarines, E-boats, minefields and the ever-present threat of the Italian Navy. Most of the supply vessels end up at the bottom of the Mediterranean. Hunger leads to desperate measures. Everything is rationed. Every piece of land is tilled, even small patches of shallow soil in rocky areas. Every vegetable grown helps stave off starvation. The farmers work from dawn till dusk, sometimes not even taking shelter during air raids. On April 25, the farmers at Qammieħ, in the north of Malta, were on edge. Usually the daily enemy raids headed south, towards the airfields and ports, but that day the Luftwaffe chose a different target. At 6.40am, German bombers flew low over The King’s Own Malta Regiment Camp at Għadira, 500 metres away from the fields of Qammieħ, and bombarded it. The same happened at around noon. The farmers kept glancing nervously at the sky, expecting another attack. Then one of them spotted an aircraft coming from the direction of the Red Tower, heading their way, engine racing. He gave a warning shout and they all scurried for cover behind the stone walls. The aircraft approached in a shallow dive and turned towards them. They thought they were about to be machine-gunned. But they couldn’t have been more mistaken. The aircraft was in trouble. Engine racing, it slammed down on its belly in one of the fields and disappeared in a cloud of dust. The once sleek war machine slid around 10 metres, leaving a deep furrow in the soil, demolished some irrigation stone canals, went through a rubble wall and finally came to a standstill in a neighbouring field. One of the farmers, recognising the aircraft as a Hawker Hurricane, rushed out to help the pilot. When he reached the cockpit, the pilot was still alive but he could do little: he died in his arms a few minutes later. The British Services took away the dead pilot. The farmers petitioned the British government for compensation for the devastation the Hurricane had wrought in their fields. A few years later, the wrecked remains of the aircraft were removed from the area. The plough continued to unearth pieces of aluminium and cast iron for many years. These were thrown away by the farmers, mostly in the rubble walls. And the story was slowly forgotten. Only the memo­ries of those who had witnessed the crash survived. Or was there something else left? There were quite a few people who recalled the crash of the Hurricane. Anni Vella (née Bonanno) was at home when someone knocked frantically on their door to tell her mum that an aircraft had crashed and caused some damage in their fields. Her father, who was on the spot when the crash occurred, was unhurt and, when he returned that evening, he recounted how the stone irrigation canals and the rubble wall were gone. When she visited the crash site, Anni could see with her own eyes the ruin the plane had left. There was a large crater in the soil, around two feet deep, while bits and pieces of metal were everywhere. A large pile of debris showed where the plane had slid to a halt. A woman who lived close by in a farmhouse at Għadira was rummaging around in the wreckage when she came upon a glove. She picked it up and a ring fell out which she took. Mari remembers that as a child, she spent countless hours playing on the Hurricane seat, moving the control column, pretending she was flying. A few years later, all the wreckage was removed from the site by government officials. But not everything! Her husband Feliċ said that the tail wheel and the control column were still there up to a few years ago, until they were given to someone from the town of Siġġiewi. Another person who was interviewed was Joe Borg. Despite knowing little about the crash itself, he thought he knew where part of the Hurricane was. One of the farmers in the area, Ġużepp Borg, was an avid hoarder. So when this ‘Godsend’ arrived from the skies, he dismantled whatever he could and carried it all away. Most of the material he took ended up forming part of the tools he built himself. When later he emigrated to Australia, he took everything with him. But not all. Hidden behind a stone wall, he left a strange metal ‘tube’ and it was this that caught Borg’s attention. A glance at this metal object was enough to show that this could have been a part of the Hurricane. And my suspicions were right. 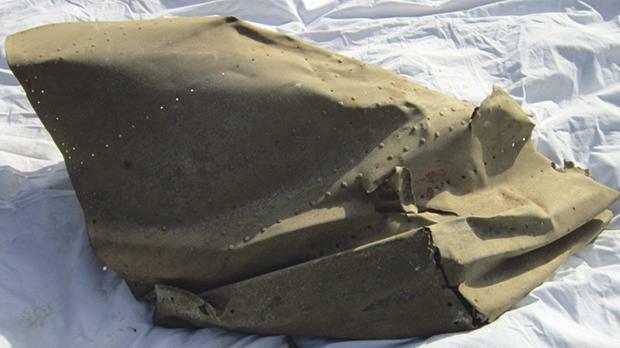 The Malta Aviation Museum confirmed that it was an intake manifold from a Merlin engine. Both Hurricanes and Spitfires had Rolls-Royce Merlin engines. A search in the fields revealed many small pieces of aluminium and cast iron. These were found in the soil and in the rubble walls. An interesting find was a piece of cast iron with the letters ‘RA...’, and below, the letters ‘RR’ – Rolls-Royce. It was part of the engine casing. One of the farmers mentioned that he knew where the Hurricane wing was. A week later, he showed me a sizeable piece of Hurricane skin. It still had some traces of red, blue and brown paint. All this confirmed that an aircraft had crashed there. But who was the pilot who died in his Hurricane in that desolate field? A look at Anthony Rogers’s book Air Battle of Malta showed that on April 25, 1942, there were three British aircraft shot down. These had been flown by Flying Officer Kenneth Pawson, Flight Sergeant Lucien Brooks and Warrant Officer Douglas Corfe, respectively. Pawson, who flew a Supermarine Spitfire, was hit by an enemy aircraft and crashed at Burmarrad. He died later that day from his injuries. A few years ago, some remains of his Spitfire were located at Tal-Qadi Temple and a glycol header tank was found in a nearby field. There is a mystery on how Brooks met his end. 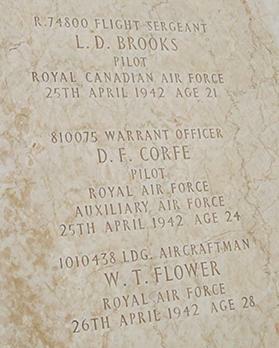 A pilot who witnessed the incident mentioned in his diary that Brooks was hit by an enemy aircraft and crashed on Bajda Ridge. But when, years later, the same pilot published a book based on the same diary, he changed his version and said that Brooks’s Hurricane was hit by friendly anti-aircraft and crashed near the shore at St Paul’s Bay. Corfe was shot down by a BF 109 flown by Hauptmann Wolf Dietrich Wilcke of JG 53. 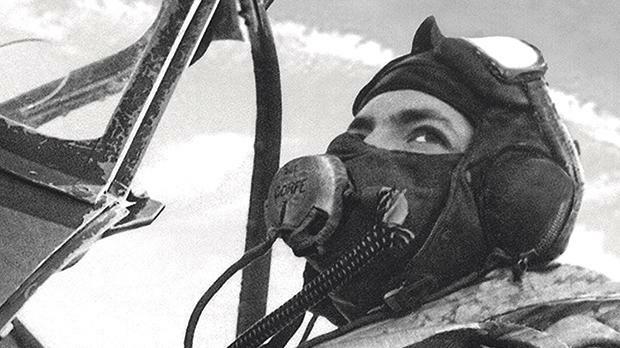 His crash site was unknown, so there was a high probability that the wreckage of the Hurricane discovered in the Qammieħ field was from his aircraft. However, nothing was certain, for in the 1990s, wreckage from another Hurricane, mainly the tail section, was located beneath the cliff face at Qammieħ. None of the remains showed any identification numbers or serial marks, so it was impossible to tell which one was Corfe’s. It was Rogers, an expert on aircraft losses and crash sites in Malta, who provided the final and most important piece of the puzzle. He kindly provided a document from the National Archives in Kew, England, which gave these details: “14:08 – Air Raid Warning W/O Corst (sic) (229) & P/O Pawson (601 or 603) both crashed and dead. The former at 313350 (150 yds Torri la Mar) the latter at 3930 (Hill 162)”. The map reference 313350, which marks the area of the crash and the distance from the Red Tower (Torri la Mar), both confirm that the Hurricane in the field at Qammieħ was Corfe’s. But who was Douglas Corfe? 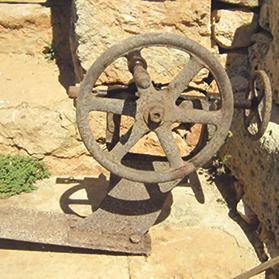 One of the tools Ġużepp Borg built – in this case to aid him to repair windmills. Corfe was a hero in the Battle of Britain. He became well known when his photo, taken in his Spitfire cockpit, appeared in many magazines, newspapers and books. “Attacked by three Me 109s, went into a steep right hand turn and saw one Me 109 at same level. Closed to 300 yards and fired five one-second bursts, closing range. However, he did not always have it his own way. On August 22, 20 Bf 109s dove out of the sun on 610 Squadron and Corfe’s Spitfire was hit. However, he managed to bail out safely. On September 18, while with 66 Squadron, he was hit again. His Spitfire went in an uncontrolled dive. He tried to bail out but found that the cockpit door had jammed. Then, at a height of a few hundred feet, he was jerked clear of his Spitfire. On landing, he suffered a severe leg injury and was admitted to Chatham Hospital. His leg injury kept him grounded for a long time. 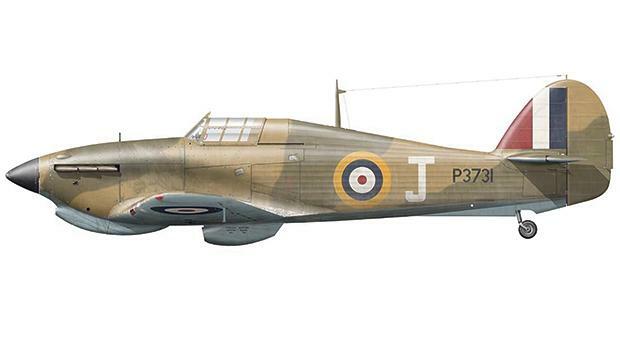 In 1941, Corfe was sent to North Africa from where, on April 19, 1942, he flew his Hurricane 720 miles to Malta to join 229 Squadron in the defence of the beleaguered island. Six days later, at the age of 24, he met his fate in the field at Qammieħ. Douglas Corfe was one of many heroes who left his family and his country to help stem the Axis tide in the Mediterranean. Margaret Farren, his girlfriend, continued to mention ‘Dougie’ for a long time, so much so that her daughter Ann Sadler tried to find out how he met his end. The author tried in vain to contact her. Hopefully, this article will help remind us of Corfe and thousands like him who died so we can be free today. The author wishes to thank the following, without whose assistance this article would not have been possible: Anthony Rogers, Anni Vella, Joseph Vella, Joseph Borg, Lucy Borg, Rita Borg, Feliċ Fenech, Mari Fenech, Joseph Aquilina, Karmnu Borg, Carl Vella, Jimmy Muscat, Morris Bartolo, Ruben Vella, Fr Joe Caruana, Ezechiel Busuttil, Christine Sammut, the Malta Aviation Museum and the National Archives.